Ergotech: Ergotech to Release New VESA Mount Freedom Arm! Ergotech to Release New VESA Mount Freedom Arm! Come November, Ergotech will release its new VESA Mount Freedom Arm, which will be compatible with the all new thin model iMacs. With the new design, Apple decided to permanently attach the stand to the iMac, no longer allowing monitor arm attachments. You can, however, purchase the new iMac with a built-in VESA mount rather than a stand. Lucky for anyone purchasing a new iMac, Ergotech Group is now releasing the newest model Freedom Arm…the FDM-S01-MAC-VESA. This design features a new interface with a VESA plate adaptor which will directly attach the arm to your iMac monitor. YOU MUST pre-order your new 21.5” or 27” iMac from Apple with the built-in VESA mount, because as mentioned earlier…the stands on the new iMacs are permanently attached and can not be removed. Ergotech’s new Freedom Arm for the iMac will provide you and your iMac with the most innovative and versatile mounting solution that you could imagine!! 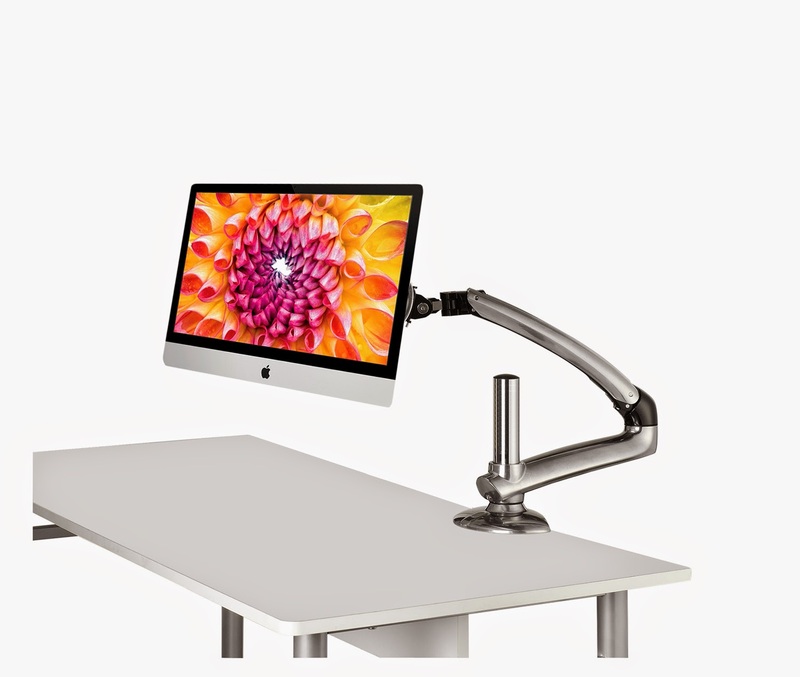 The Freedom Arm by Ergotech Group is a unique monitor mounting arm that will not only mount your iMac monitor, but it will provide your iMac with the freedom and versatility it needs and deserves to move readily around your workspace! By enabling you to position your iMac monitor at any angle that is most comfortable for you, the Freedom Arm allows you to work in complete ergonomic comfort and prevents you from putting any unnecessary strain on your eyes, neck, shoulders, or back. The Apple iMac is a machine to admire. Everyone loves the Apple iMac, and, naturally, everyone who owns one would probably love to be able to mount it to their desk, simultaneously free up their precious desk space, and move the monitor freely around their workspace. Just think about it: When you’re working at your desk, whether or not you’re using your iMac the entire time, wouldn’t it be nice to have space at your desk to spread out your materials?! Even further, how great would it be to be able to sit in a perfectly comfortable upright position at your desk and extend your iMac monitor out so that it is positioned directly in front of you?! If you think that sounds awesome, you haven’t heard anything yet. Even better than being able to simply bring your iMac screen to you when you’re sitting at your desk, how would you like to be able to adjust its orientation and position it any angle that you desire?!?! This might sound like a fantasy, but I promise you, with the Freedom Arm for the iMac by Ergotech Group at your disposal, practically anything is possible!! Ergotech’s Freedom Arm enables you to adjust your iMac monitor height, enjoy full range of motion for your iMac monitor, and tilt it up 90°, down 45°, pan 180°, and rotate 360°! Better yet, all of these adjustments can be made with ease, whenever you like, using only one hand!! For more information about Ergotech’s line of Freedom Arms, please CLICK HERE.